Bored of the same old colour of your car? Then why not have your vehicle wrapped with a self adhesive coloured vinyl. It's a great way to customise your car or van. There are hundreds of colours in a variety of effects, from matt black or white to carbon fibre, iridescent and pearl effects. The vinyl wrap can last upto 5 years, will costs less than a traditional paint respray and we will only need your car for one day! 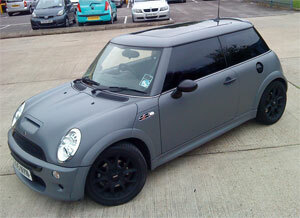 Once you bored of the vinyl wrap colour it can be stripped off and rewrapped with another wrapping vinyl. The vinyl wrap will not damage your paintwork as long as the paint work is sound when removed correctly so your car can be wrapped as many times as like. There are many benefits to having your car vinyl wrapped like keeping up with modern colours like matt black or carbon fibre effect. The vinyl wrap will also protect your cars original paintwork from scratched and small stone chips thus giving your car a better residual value. Not all the car has to be wrapped, sections of the car can be wrapped to colour code panels of the car, like just the bonnet and roof to match the chrome plated wheels! Give us a call today and prices start from just £600 + VAT. We can give you a quote to wrap your car over the phone. All we need is the make of your car, the type of coloured vinyl or effect and how long you want the wrap to last with 1, 3 or 5 years.